Another 2 Down, 2 More to Go! It has been a while since my last blog post, and so much has happened! After the Flathead Dog Days race, we began going to West Yellowstone to train so we could get longer training runs. We head down an train one day, spend the night, and train another day before coming home. In West, we train on a trail that is pretty much flat. Since the Jr. Iditarod is all flat, we want the dogs to be working on the flat trails instead of the mountainous trails they are used to. 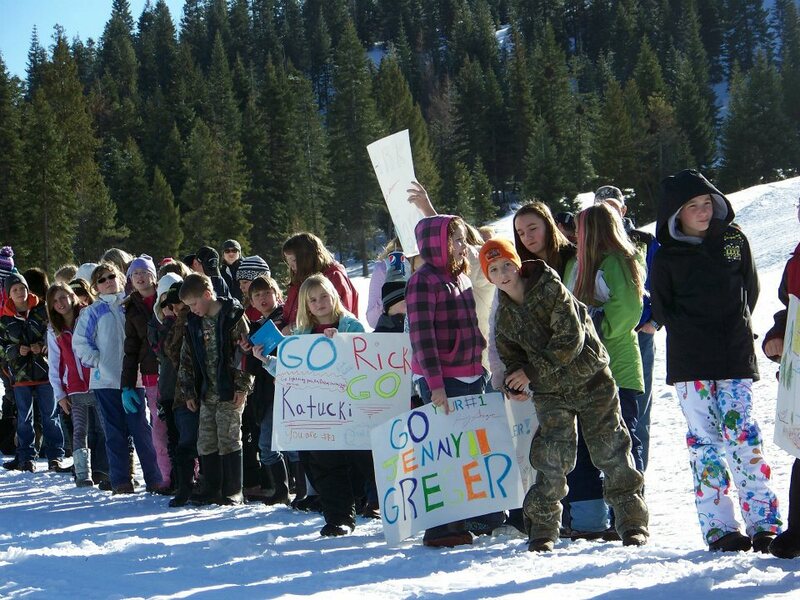 In the midst of these 40-50 mile runs we've been doing in West, we headed over to Darby, MT, for the Darby Dog Derby. It was a two day, 8-dog race, with two 20 mile runs. Since we've been running longer miles, this race was just going to be a fun, short race for the dogs. We were competing against 5 other mushers, all of which were 18 years old and under except one (though people who know that one might say he is still young at heart [: ). We ended up placing second, even with just taking it easy! Dad also raced. He ran the 6-dog, 7 mile sprint and came in 5th place. He also received the Sportsmanship Award for helping one of his competitors, who was a junior musher, on the trail when she ran into a little bit of a problem. Spencer and Gary also came, and Spencer ran in the 4-dog, 4 mile class and got 3rd place. This was his first race too! He has some of our dogs: Lori, Robin, Piper, and Gandalf. We had a fun time at the race and camped out at the race site in the dog trailer with the dogs. Steve Peterson, Bailey Vitello, and Gregg Vitello were also camping out there too, so we had some good conversations with them over a nice fire. After the race we went back down to West for more training, but this time it was a little different. Since it was the weeks before the big Stage Stop race in Wyoming, almost all the stage teams were down there training, including the 2-time defending champ Buddy Streeper. It was so cool to be training on the trail and seeing other teams, especially teams of this caliber! When these fast stage teams would pass us, we actually kept up with them for a little while. This was pretty good since I was doing 50 mile runs, and they were doing 35 mile runs! Soon we were off to the first distance race of the year in North East Oregon! 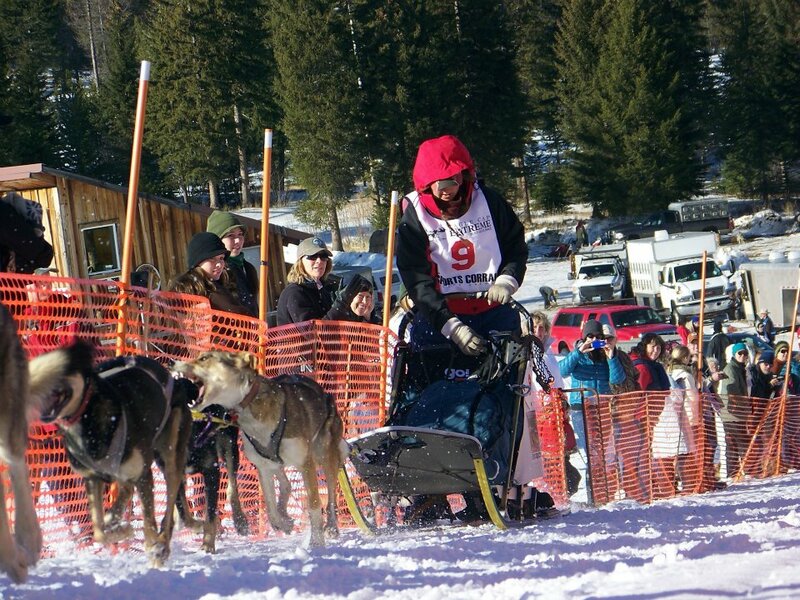 This race, the Eagle Cap Extreme, was an 8-dog, 100 mile continuous race. The race started by going up a ski slope and to the Ollokot checkpoint, where we would have a mandatory 6 hour rest. After our rest, we would head back and finish by coming down the ski slope! The checkpoint could only be reached by dog team or snow machine, and it was unassisted. Unassisted means that I could not have any handler help and would have to take care of the dogs all on my own. We sent up a drop bag before the race to the the checkpoint that contained supplies I would need at the checkpoint like dog jackets, writs wraps, dog food, people food, water, and more. The checkpoint was in an awesome location and organized very well. All the volunteers, race officials, and veterinarians at the check point were very helpful! 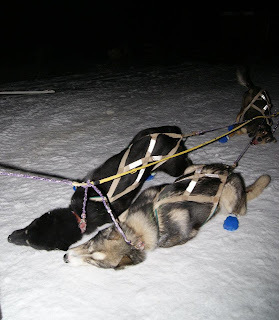 We were the first team into Ollokot due to passing all the 12-dog teams and one 8-dog team ahead of me. Because of this, I think I got the best parking spot in the checkpoint since I was closest to the bathrooms, drop bags, hospitality tent, and exit. Once I got in, I mixed up a meal for the dogs and fed them. After they all finished eating, I put dog jackets on them and layed out hay for them to sleep on. The vets then came to do a mandatory check-up on all the dogs, and they were all looking awesome! I then put wrist wraps on all the dogs and let them sleep. While the dogs slept, I ate some food myself and went to check what time I could leave. I had come in at 6:20pm and could leave at 12:32am when my mandatory rest was up. 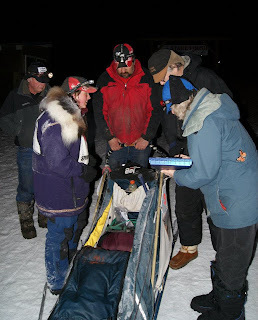 I then layed down in my sled with my sleeping bag until 10:30pm, 2 hours before my departure, to feed the dogs again. This meal was to be just water and meat since the goal for this feeding was to get the dogs really hydrated before the run. Once everyone was finished eating, I started cleaning up so I would be ready to go when the time came. When midnight came about, I started really getting ready to go. I took wrist wraps off and put booties on everyone. I then took all their dog jackets off and put them away. At this point they are still calm and just hanging out, but then when I started hooking there harnesses to the tug lines, they started freaking out and getting excited to go! Once everyone was hooked up, we took off towards the exit where the race officials did a quick bag check and signed me out. Off we went towards the finish, and we were currently in first place with the second place team 40 minutes behind! So that was my account of the checkpoint, now it is time to tell you about the actual running of the trail. This was the most mountainous trail we have ever done in a race, and we LOVED it! The dogs were super amped because they had been training on flat trails lately and were ready for some climbs. I was very happy because going up the hills gives me a rest from riding the brake the rest of the time. This is also a reason my dogs like the hilly trails better too because they know I will let them go as fast as they want up the hills. To them, I am a party pooper the rest of the time and ride the brake. Little do they know that I am keeping them slowed down for their own well being. The dogs were just doing awesome the whole time and I was keeping slowed down since they wanted to go really fast. 9 miles from the finish, I decided to let them go so they would maybe be a little tired before having to plunge down the ski slope. They didn't get tired. In fact, they were never tired, not even at the end. We really did come screaming down that hill too, though it didn't help that the dogs were chasing 2 snow machines down it. We had been catching these two snow machiners (who were race crew marking the trail) about every 5 miles the whole run from Ollokot to the finish. When we'd catch them, I'd talk to the dogs and say "get 'em" and make a game out of chasing the machines. The machines were waiting at the top of the ski hill to ensure that there was a good path down for me, but Alice and Bella were determined to "get" those machines this time, so they were charging down the hill after them. We made it to the bottom all safe, but I know have a new appreciation of steep trails. We also crossed the finish line in first place, 45 minutes in front of the second place team! We also set some records! I became the first female to win the race and the youngest to win the race, and we had the second fastest race time in the history of the race! 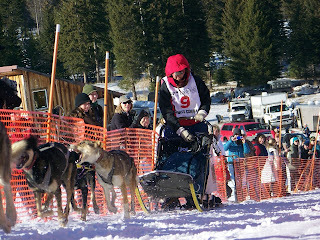 The dogs did awesome and were ready to do another 50 at the finish, which is what we want since they'll be doing another 50 miles in the Jr. Iditarod. In addition to first place, I received the Best Cared for Team award from the vet team! This was truly an honor since all the mushers take great care of their teams. This is WAY more important to me than the first place trophy since I am always taking the best care of my pups as I can. This isn't an award you try to win, like how you try to win the race, it is an award that recognizes your effort to care for your dogs everyday. This is my 5th Best Cared for Team award that I have received in the past 3 racing seasons! My dogs are quite the characters. At the Eagle Cap they really got me and some other people laughing. First, some back ground knowledge for you all. Last year, in the Conconully Super Mush and Cascade Quest, Bino Fowler was the only team that my team did not pass or did not pass and pull away from. We did a lot of running side by side in the Cascade Quest too. My dogs know that it is good to pass teams, so they are always wanting to pass all the teams in front of them and leave them in the dust. So, at the start of the Eagle Cap this year, when Bino started hooking up his dogs, my dogs started barking at them. This was not the usual, "Hey, those dogs are going, we want to go too!" bark, it was a straight up smack talk bark. They have never done this to another team before either! Then, once we passed Bino's team on the trail (he was running in the 200 mile race), the dogs got fired up and zoomed away from him and were so happy that they finally got to pass him! The third encounter was at the Ollokot checkpoint. We were in the middle of the vet check, and teams were coming in to the checkpoint and picking up their drop bags right next to where I was parked. The dogs were paying no attention to ANY of the teams until Bino's team pulled up. They all stood up all tall and mighty and were growling and barking at Bino's dogs! Again, never had they done this to another dog team before! So, that is proof that the dogs are just as competitive as the mushers are at times! 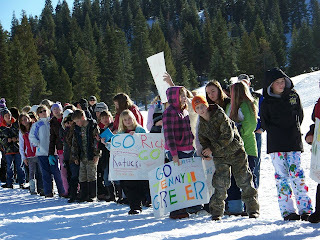 After we returned from the race, we started training back in West and preparing for the last two races of the year, Jr. Race to the Sky and Jr. Iditarod. The start, Kaycee really wants everyone to go faster!